Years ago I discovered the joy of cooking pasta right in the sauce. It doesn't work for everything, of course; but any time I can turn something into a one-pan meal, I'm happy! Then, while I was selecting my favorite organic canned tomato products, I discovered my store had added a new item to the section: organic crushed tomatillos. I was so excited! Right away I thought of two things I just had to make with it: chicken enchiladas and a chicken pasta concoction. So here's my one-pan chicken pasta concoction. It's nice to get out of my tomato-y pasta rut once in a while! I prefer the mini penne when I can get it. If you use regular penne, you might need to add a few minutes to the cooking time. Use your own judgement on the jalapeno pepper and crushed red pepper flakes. I like a little heat, but not enough to make my face sweat! Where do you stand on that issue? 1 In large skillet that has a lid (I use the 12-inch straight-sided All-Clad Stainless 6-Quart Saute Pan) over medium-high heat, heat 2 tablespoons oil until very hot. Add the chicken seasoned with 1/4 teaspoon each salt and pepper, and cook until lightly browned and done, 7 to 10 minutes; remove from skillet. 2 Add 1 tablespoon oil to skillet and cook onion for 4 minutes. Stir in the crushed red pepper flakes, red bell pepper, jalapeno and remaining salt and pepper; cook for 1 minute. 3 Stir in the broth, tomatillos, cilantro, cream and pasta. Bring to a boil. Reduce heat, cover and simmer for about 14 minutes, until pasta is tender. 4 Over low heat, stir in the chicken, cheese and lime juice for about 3 minutes. Garnish with chopped cilantro. I think I'm trying it too, your recipes are ... unbeatable !! Dany, thank you! I hope you will try it soon. Funny you should say "speaking a little of Italian" because the brand of pasta I bought was from Italy! I MUST make this recipe soon. Thanks so much for sharing with Roses of Inspiration. Hugs! Thanks, Stephanie! I think you'll really like it. If you make it, do let me know how it turned out for you. Your grilled cheese sandwich sounds wonderful! Sounds delicious...thanks for sharing with the Thursday Blog Hop! Thanks, Pam! And it's fast and easy enough for a weeknight. I love the idea of one pan. I usually do my pasta the traditional Italian way but your way is too tempting to pass up. I love your flavor combinations too!! Great recipe. Thanks, Marisa! Some dishes definitely need the pasta cooked the traditional Italian way, but whenever I can get away with saving a step--and a pan--I like to do it. Every now and then I salivate for the starches that I otherwise avoid. Nothing against breads, potatoes, macaroni and cheese, pastas and other forms of the “paste” that so many people seem to favor. And if those starches had no calories, I’d consumed them every day. But the trade-off of a meager taste indulgence for too many calories is, in the words of Tonto, a “bad trade.” Too tepid, too bland. A taco wrap or hearty plate of spaghetti will satisfy my errant walk on the dark side of diet for months on end. I think it’s mostly a taste acquired in childhood that directs us to get our calories from either sugars or fats or starches, and that’s what we migrate back to more or less for the psychological comfort. Amen. Sully, sugars, fats or starches? I like them all in small amounts, but I'm definitely in the starch camp. Potatoes and bread. Especially bread. Even so, I usually limit myself to the bottom slice of bread on sandwiches. Even though the bread is my favorite part, I know I need the protein not the starch. I'd recommend you just slap this sauce on some chicken; it's really tasty! I didn't know that penne pasta came in sizes, but will look into that. Your recipe is my idea of comfort food, and I would add both jalapeño and cayenne, but maybe not quite as much jalapeño. Ours from the garden (which i froze in halves) are in a variety of sizes. This looks great, Jean. Thanks, Judy. Yes, I *love* my mini penne! Not all brands carry it, but I've bought it in probably 3 different brands, one of which is Barilla. AND I noticed the regular grocery stores are now carrying gluten-free pasta. I also didn't know penne pasta comes in different sizes! This looks really yummy! Angelina, thanks! A nice cheesy pasta dish is so warming on a cold winter day! I'm going to share this one with the head chef. I think he'll like the idea of cooking the pasta right in the sauce. Thank you! Always happy to join SYC. Hope your "head chef" likes the pasta! You make simple everyday dish so very tempting and moreish, Jean. Angie, thanks! I'm picturing one of your beautiful different-than-usual-grains breads with this! Looks really yummy,Angie. A great one-dish meal. Thanks, Linda. I just love a good one-dish meal! Thanks, Emily. I really think it is, if I do say so myself! Thanks, Gary. That sounds like a handy pan, and I like that it's all stainless steel. I inherited nervousness about pressure cookers from my mother, but I'm sure they've gotten to be very safe by now! Not real fond of pasta but the recipe is interesting..
Margaret, many of us *wish* we weren't real fond of pasta! :D If I didn't like pasta, though, I'd make this sauce for chicken and vegetables. Hello, this looks delicious. Thanks I will be saving this recipe. I agree it sounds good with or without the pasta! Have a happy weekend! Thanks, Eileen. And a happy weekend to you! Stay warm and cozy! We would love this; thanks so much for the recipe. I appreciate you stopping by today. God bless your weekend. Mildred, thanks. Hope you'll try it soon! Have a wonderful weekend! Thanks, Amy! I'll be making it again very soon; one of those things I could eat every day! That's great, TWG! Anybody in Texas would surely like the tomatillos and jalapenos! 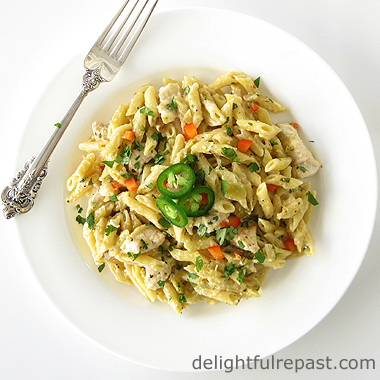 Love this one pot pasta dish, as it has heat jalapenos salsa verde is my weakness. I need to try it, Thanks for sharing with Hearth and soul blog hop, pinning, tweeting. Swathi, I'm so glad you like it! Thanks for pinning and tweeting -- much appreciated! Thanks, Greg. Fruity is just the word I was looking for! I do like some heat, Jean, and your dish sounds perfect! I'd love trying the crushed tomatillos and cooking the pasta right in the sauce. Kitty, thank you! I hope you'll try it soon and let me know how you liked it. Thank you, Deborah! I'll be stopping by again! I love one pan dinners and this looks terrific, Jean! I tend to make a lot of tomato based pasta dishes, it really is nice to have a delicious, flavourful alternative like this. Pinned and will share. Thank you so much for being a part of the Hearth and Soul Hop. April, thank you so much! You're the best! I've never cooked pasta in the sauce, I need to try it soon. And this recipe is such inspiration. Love everything about this Jean. Thanks for sharing a great idea. Thank you, Lea Ann! I think once you try it, you'll want to use that method every chance you get. Really simplifies one's life! This looks so delicious! I had no idea Muir Glen made crushed tomatillos either. Time to go shopping! Richard, thanks. I love Muir Glen products, and the tomatillos even more because they come in a jar. I'm going to have to look for the crushed tomatillos as your recipe sounds delicious. If not I'll cook some fresh ones. Karen, thanks so much! Tomatillos have not been used nearly enough in my kitchen. That's all going to change! Thanks, Jan! Hope you like it as much as we do!